All fly shops carry squirrel tails. Here are a few great ideas for tying better flies using this common and inexpensive fly tying material. Thread: Red 3/0 (210 denier). Eyes: Dumbbell or bead chain. Body: Krystal Flash, red or color of your choice. Our family has had a long love-hate relationship with squirrels. 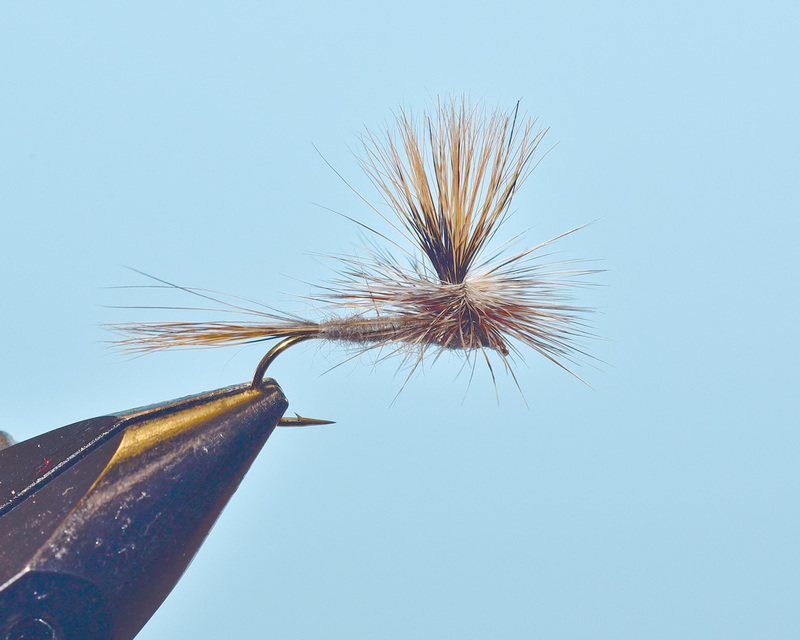 Gretchen’s father, Dub Evans, often used squirrel tails in his commercial fly tying business in the 1940s and 1950s, eventually passing his love of the material onto his fly tying daughter. As a farm kid living in Iowa, Al soon learned that squirrel-tail hair is a great tying material. In the 1950s, there were no fly shops near his home, but there were plenty of squirrels living in his backyard. Squirrel tails were readily available, and Al harvested and used a lot of them. The availability of so many squirrels was both good and bad. It was handy to have squirrels available for tying flies, but those cute little critters could quickly tear up a granary in their zeal to get to the corn, beans, and grain. Keeping those destructive rodents in check was a never-ending chore. While Al loved having so much tying material right out the back door, his father became quite concerned for the safety of his crops and buildings. About the same time, many miles to the west in Idaho, Gretchen’s father experienced a similar problem with the local squirrels that wanted to steal the crop from his favorite walnut tree. In the end, when we got married in the early 1990s, we had far more squirrel tails than we could ever use, so we donated many of them to a local fly tying club. One of the fun things about sitting together every day while tying flies is you have a lot of time to brainstorm new ideas. We often discuss designing flies using the excess materials we have on hand. If you haven’t guessed by now, squirrel tails keep coming into our conversations. Hook: 1X-long dry fly hook, sizes 18 to 10. Tail: Red squirrel tail hair mixed with grizzly hackle fibers. Parachute wing: Squirrel tail hair. We still remember our first order for flies requiring squirrel-tail hair; it was for 30 dozen Squirrel-Tail Spruce Fly Streamers. We were pleased to find a use for some of our excess squirrel tails, but getting the flies to the shop was a bit of a journey. This is where the word “fan” comes into the title of this article. 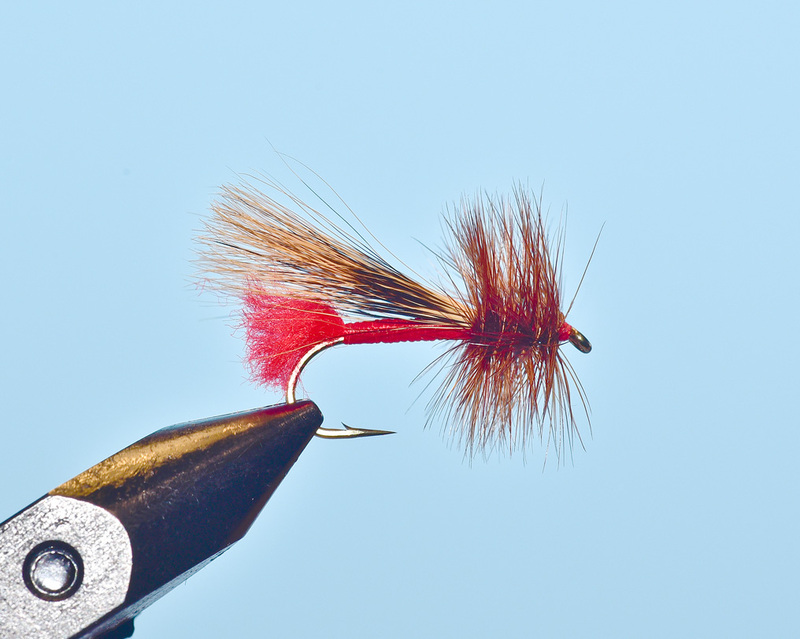 One of Al’s all-time favorite streamers is the Spruce Fly tied with a set of furnace hackles for the wings. Fox squirrel tail hair makes a similar looking wing, but while the new fly looked great on the hook, the hair wing didn’t produce much action in the water. It took us the better part of a summer to figure out how to put more motion into a squirrel-tail wing. The idea to tie the hair wing in the shape of a fan so it would move in the water came from an unlikely source. One day, while at the vise, Al told Gretchen about an interesting-looking, hand-operated cooling fan he had seen in Southeast Asia many years before. The fan featured several squirrel tails lashed together with long palm leaflets. Gretchen thought about it for a minute and then asked if the same idea would work for tying the hair wing on a fly? Could we, she wondered, make the wing on a Spruce Fly using small bunches of squirrel tail fibers? That was the solution to our problem, and over the years we have created other patterns using this technique. Hook: 3X-long nymph or streamer hook, sizes 8 to 4. Hook: 3X-long dry fly hook, sizes 10 to 6. Thread: Red or orange 6/0 (140 denier). Tail: Red yarn or dyed calftail. Body: Red or orange floss. 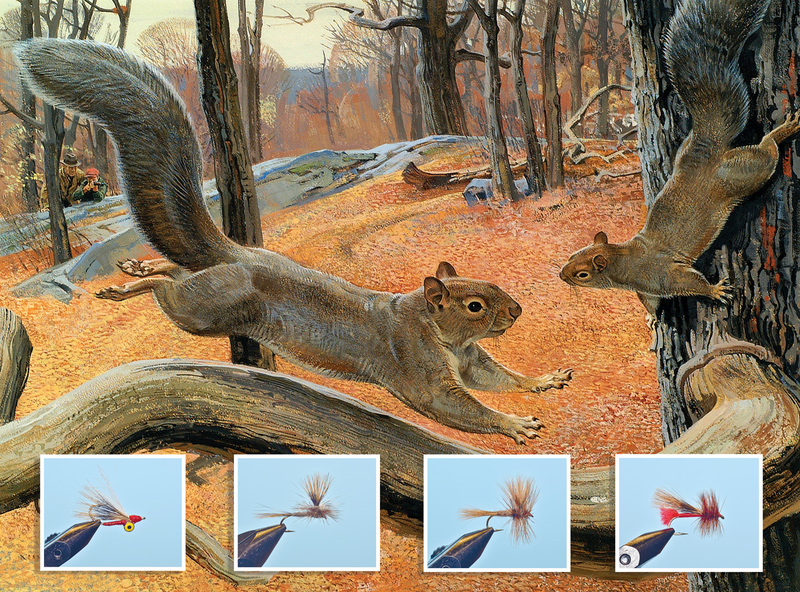 Of the five species of squirrels found in the United States, three natural colors are most useful for tying flies: red, black, and gray. Of those three colors, we have more red squirrel tails in our supply cabinet; this is probably because it’s the color of the little cuties living in our back yard when squirrel season comes around each year. Keep in mind that our tying technique also works using dyed squirrel tails, so you have a lot of possibilities for improving older pattern and creating new, fish-catching flies. We’ll demonstrate two different tying methods. In the first method, we’ll use thread to divide and conquer a squirrel-hair wing. As an alternate method, we’ll then use hackle instead of thread. 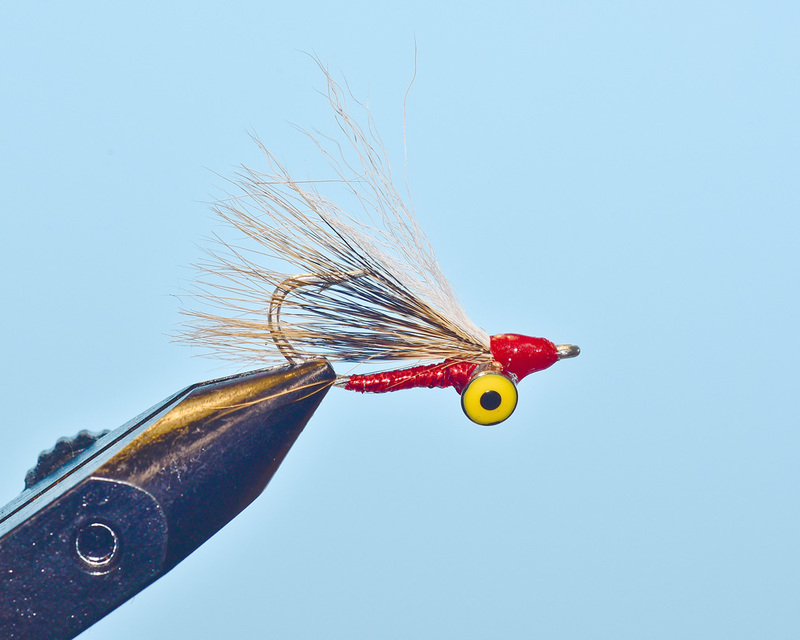 Follow along and see how to increase the action of a hair-wing streamer. In addition to making streamers, squirrel tail hair is great for tying wings on larger dry flies. We will offer two of our favorite methods for using this common ingredient for crafting dry fly wings. If you don’t have any squirrel tails in your fly tying kit, your local fly shop certainly stocks this useful material. If you do not have a nearby fly shop, we bet there are a few squirrels living in your backyard. Al and Gretchen Beatty have contributed many articles to our magazine. 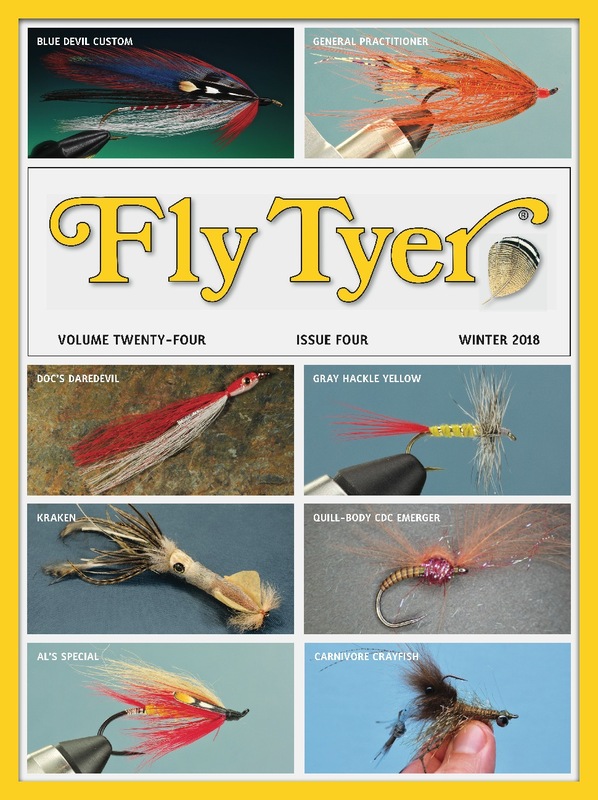 They are also busy leading fly tying classes across the country, writing books, and much more. Be sure to visit their website, www.btsflyfishing.com. Al and Gretchen live in Idaho.